Undoubtedly Joseph Haydn may be considered the master of Classical-era symphonies. He wrote 106 of them, after all, and many are considered among the finest of their time. Indeed, Beethoven and Mozart both recognized his genius in symphony composition, and today his 12 "London" symphonies are still considered masterworks of music, among the highlights of music of any era. These two symphonies, recorded by the Royal Concertgebouw Orchestra, were both written for his second visit to London, in 1794, perhaps the period of his most profound symphonic achievements. If naught else, these certainly form the capstone of his prodigious career, and the pinnacle of his symphonic output. Symphony 99 was the only one of his London symphonies not to have been written in England. Haydn actually composed the work while at home in Vienna before departing. The work itself was very well received by the public at its debut, and still stands out as a brilliant work. It begins deliberately, leading the listener through a tense opening until it grows into a thematically independent and exuberant main subject. The second movement is considerably more serious, and displays the genius of late Haydn, especially in the woodwind writing. The third movement returns to the original key and feel, playing with the symmetry of the composition only in the trios. The finale is at times tumultuous, at times exuberant, and throughout playful. Symphony 101 has its name derived from the opening of the second movement, which the London crowds associated with the movement of a pendulum. The four movement work is in every way classical, and yet innovative inside the constraints of form that Haydn imposed upon himself. Indeed, it is considered by some to be the greatest work of Haydn�s symphonic career. While there have been many recordings done in recent years of Haydn�s work on period instruments, here the symphony is more �normally� equipped. This does not in any way diminish the recording, or disparage the symphony. Many, if not most, listeners will appreciate the technical advantage that these instruments give the modern player. The casual listener would likely not notice a difference unless played adjacently to a performance on period instruments, and then one suspects that a substantial group would prefer the modern equipment anyway. The recording is well done, with the symphony skillfully employed and well conducted. Conversely, there are many very good recordings competing with this currently, as it suddenly became in vogue to record collections of Haydn�s "London Symphonies" in their entirety. As many of these are also excellent recordings, and more complete, it is a rare listener that would have a reason to select this disc over one of the more complete collections. 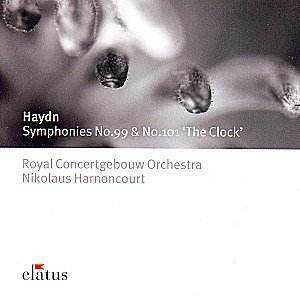 While this is certainly an excellent recording of two of Haydn�s most important and best symphonies, there is little to differentiate it in a somewhat cluttered market. Should a listener have a particular fondness for these symphonies, this would be a welcome addition to their collection, as the performances are indeed exquisite. However, if the listener wants a collection of Haydn�s symphonies, this will likely become redundant in their collection in short order.